News of the shooting swept through the schools by word of mouth, by telephone, intercommunication systems, radio and television. Normal conversational noise and laughter were missing from the halls of the high schools. William C. Sorenson, city school superintendent, said teachers were advised to follow normal schedules, But formal academic patterns were discarded. Deputy County Dept. Arthur H. Irwin said he had received no directive from the state office of education and superintendents calling in were advised to continue classes if it would not create complications. He said he had received no notifications of closures. At Gonzaga University the student chapel was packed with students offering prayers at a quickly scheduled mass and during the lunch period. Students crowded into the public relations office to listen to reports over a loudspeaker. Faculty members gathered in groups. Silence was general; there seemed to be no inclination for conversation. The Very Rev. John P. Leary, S.J., president, said a Memorial Mass for the President will be celebrated Tuesday by the student body in St. Aloysius Church. The grief here is intense,” he said. “I might say it is almost unspeakable. You ask yourself, ‘Why?’ and you get no answer. 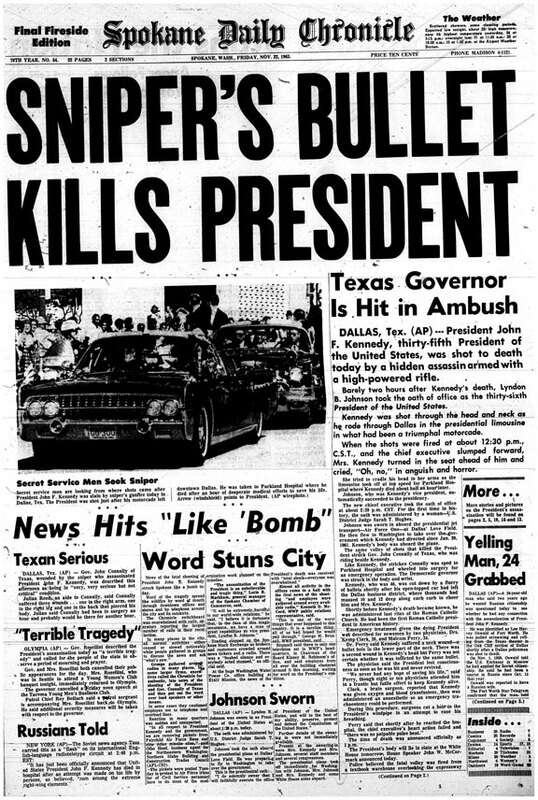 The assassination of a man like Kennedy can only be the bitter fruit of hatred and fanaticism. The annual military ball scheduled by the Gonzaga ROTC for tomorrow in the Ridpath was canceled. AT West Valley High School, the play “The Mouse That Roared,” scheduled for 8 tonight and tomorrow night, was postponed indefinitely because of the President’s death, Walter Lindgren, dramatics instructor, said. At Central Valley High School all social activities, including a play tonight and a concert tomorrow, were canceled. In the city’s grade schools, most students were notified by their teachers. Principals agreed the children old enough to realize the significance of the President’s assassination were stunned and shocked; but the students remained calm. Mrs. E. G. Metzger, principal of the Alcott School, said teachers of the upper grades notified the youngsters of the President’s death and explained the significance. The children remained calm because it was explained to them in as calm and collected way as possible,” Mrs. Metzger said. During the lunch period the older youngsters were permitted to listen to the school radio and television sets to hear the news. Ethel Moeller, principal of the Regal School, said she has notified the teachers of the President’s death but asked them to withhold the news until after lunch. R. Dean Graudette, principal of the Lincoln school, said the children old enough to fully understand the news were shocked. “The youngsters discussed it and talked a lot more than they normally would or should. We all received the news with shock and disbelief,” he said. He said the teachers had been notified and in turn talked it over with their students in order not to get the students too excited.